The morning after my big 50 I decided to treat myself to a lie in. I still woke up at 6, but I didn’t make any motions to break camp quickly. An old acquaintance, Leonidas, had been at the camp site when I rolled in at 9:30 the night before, and I think I startled him awake. He says he normally leaves camp around 5:30, so the fact that he was just breaking down at 6:00 tells me I kept him up past his bed time. I offered him some of my breakfast chocolate bar as appeasement and we resumed our conversation from the night before. We had been discussing the alternate route that splits off from the very location we’d camped at. 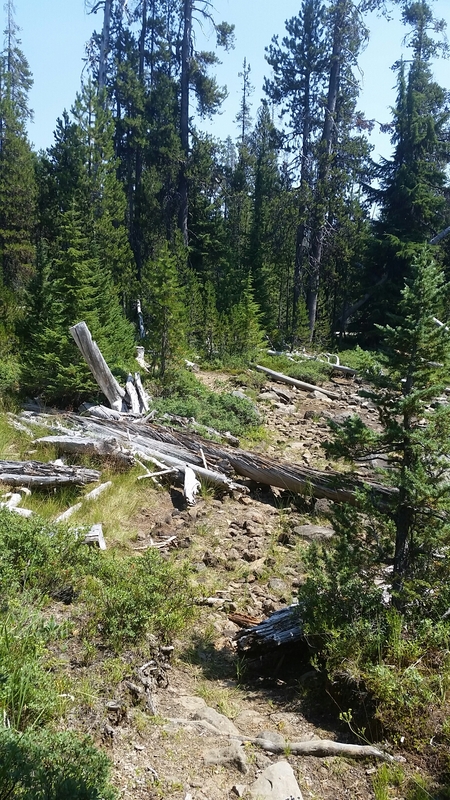 The PCT in Oregon utilised an existing trail called the Oregon Skyline Trail, and the alternate in question was along that trail. It was flatter than the PCT, supposedly prettier, had more water sources along the way, went straight to my next resupply location as opposed to a 2.2 mile road-walk/hitch (each way) from the PCT, and cut the distance by 10 miles. Now I’m no purist; I’ve hitched over 40 miles to skip road walking around fire closures, but normally I wouldn’t shave that many miles off just because I felt like it. But I did just do a 50, and not having to rush to Shelter Cove to get my resupply box did sound appealing. So alternate it was! Leonidas left shortly, but another familiar face I hadn’t seen in a while, Ball Hawk, showed up a few minutes later, so we got to talking. A couple more people I knew rolled through, and the next thing I knew it was 8:30! I finally excused myself and made for the Oregon Skyline Trail 1/2 a mile down a forest service road next to camp. Right off the bat my Achilles started bothering me again. The terrain was nice and sandy and mostly flat, so I figured it’d be the perfect time for some barefooting. I’d done a few miles here and there unshod, but I was way behind on a casual goal I set of doing 1% of the trail barefoot. Perfect excuse to catch up. It felt great to be free of my irritating shoes, but I was wondering how long I could get away without. The answer? 10 miles. Right around the same time as my feet were feeling sufficiently pumiced the terrain got less friendly and the horse poop increased significantly. I wasn’t back in shoes 5 minutes before my Achilles started complaining again. Frustrated, I sat down on a log and pulled out my trusty scalpel and performed some more surgery. By now my shoe more closely resembles a clog than a trail runner, but it worked. But then the thing I feared the most happened. It started as a whisper, and I tried to ignore it. But gradually it got louder and it was clear that it wasn’t another false alarm as I’d experienced a few times in the last month. A shin splint was forming. I struggled with one in my right leg for about 300 miles early on, and those first few days I felt completely debilitated. If this was happening my goal for Oregon was kaput. I was only a few miles out from Shelter Cove at this point, so I limped in and rested my leg for a couple hours while I sorted out my new stash of food and put the finishing touches on my blog post while I had wifi. When I got up to go it was still there, but diminished. It was 6:30 by this point and I had intended to get a few more miles in that day, and still had a 2.2 mile road walk ahead of me just to get back to trail. Looking at my map I saw that the railway paralleled the road for a bit and that there was a jeep road splitting away that led back up to the PCT. Way better than a road walk! Once back on trail, I managed another 10 miles before I no longer felt like walking, not because of shin splints, but because it was 10:15, pitch black, and I was frightened by animal noises. I’m tough, but not “fight off a mountain lion in the dark” tough. OK, so it was likely an owl, but I wouldn’t want to fight one of those either. Either way, I made camp quickly and started chipping away at the tremendous amount of food I had. Only the faintest hint of splint greeted me upon waking, so I set off at a good clip straight out of camp. 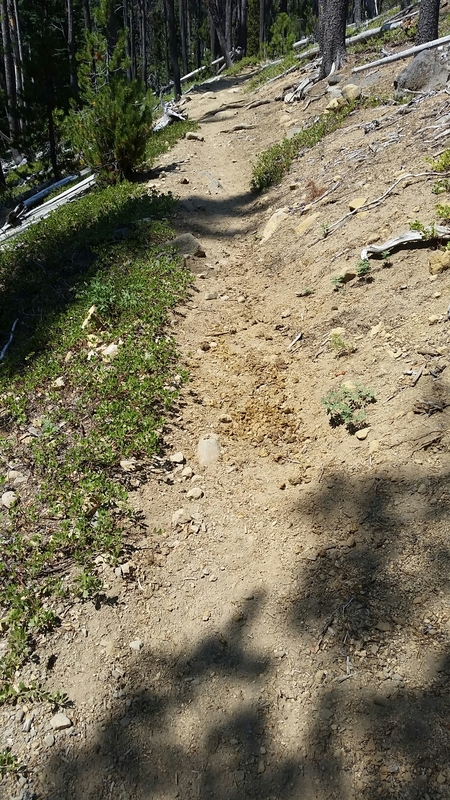 I passed a few people in the first few hours, but for the most part the trail was mine. My pace remained steady until around noon when the old shin started giving me indications that it wasn’t ready for the abuse yet, so I slowed it down. But it was too late. By 2:00 it was at about a 5 out of 10, and by 4:00, a 6. 10 most humans won’t ever experience in their lives, if they’re lucky. I planned to stop at a lake up ahead for water, so I kept going at 2/3 my normal speed until I got there. Tick Tock, a girl I had met in Seiad Valley, was there with her posse, and one of them, Ballbuster, graciously gave me some knock-off Ben Gay and a few naproxen as I had apparently lost my baggie of drugs in the last day or two. They threw their packs on and I bid them farewell, while I stayed behind to rest and elevate my leg. But I’m horrible at sitting still, so after about 20 minutes I leapt up and got back to it. The plan was to do 17 more miles, but it was nearly 5:00 and I was moving slowly still. Five miles in to that 17 the mosquitos started in on me. I DEETed up and kept on, but another 4 miles put me under a rain cloud that was spitting on me, and the mosquitos still weren’t letting up. My shin splint was getting painful enough that every few hundred feet a shooting pain (7) would make me wince and halt for a moment. It was a little after 8:00 at this point, earlier than I would normally stop, but after some internal debating I decided it best to stop. It took a minute to find a suitably flat space, but soon enough I had my pack off and raced to set up my tent while the mosquitos descended. I flung myself inside and zipped up quickly before starting in on my dinner. It wasn’t long before the rain picked up and I felt validated in my decision to camp early. I munched for about an hour, moving from “spicy beef and bean stuff” that I’d made myself months prior to Oreos to trail mix to ginger snaps. It was a great consolation feast to make me feel better about falling behind schedule. My leg wasn’t feeling too bad in the morning, but I thought it a good idea to lie in for a bit and let my leg rest a while longer and my tent dry a bit. When I finally emerged it was nearly 8:00, but I promised myself I’d take it easy. I did not. 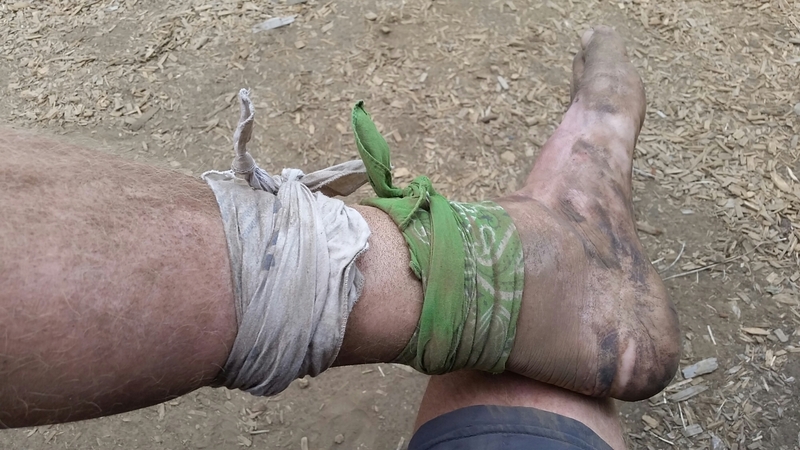 By midday I was stopping every couple miles to stretch out and adjust my shoe, trying anything I could think of to mitigate the pain, but it kept worsening. I met some nice ladies by a stream who provided me with some advil and tramadol. Neither seemed very effective after walking another 2 miles. I was kicking myself for not keeping the shin splint brace I had picked up in Tehachapi when I realized how simple a solution I had. All the brace did was provide some targeted compression. Maybe that could be accomplished with a bandana? Or two. 2 or 3. A little while later I ran into Signal, an Israeli I had been bumping into over the last two weeks, and he was apparently having shin splint issues as well. I taught him my trick and we both ran off with renewed vigor. 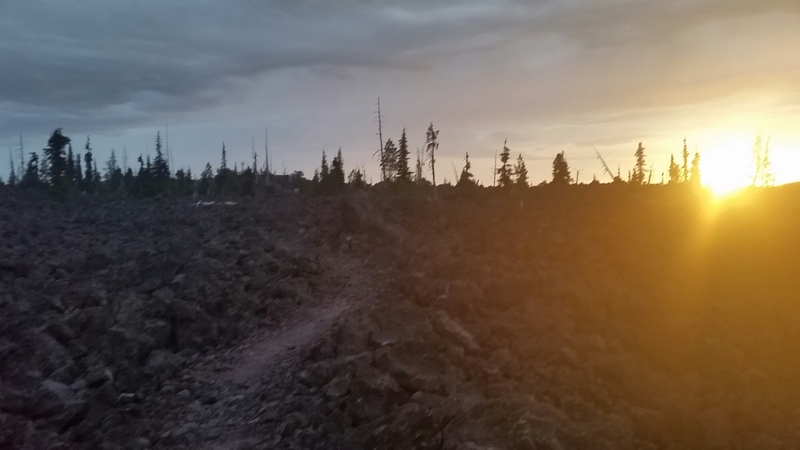 We went over a small, pumice strewn pass and crossed a miles-wide lava field as we approached the first of two highways that leads to Sisters, OR, and then on to Bend. Signal would be getting off there for a day, but I crossed over the highway and continued on, wondering if I’d make it somewhere campable by dark. I didn’t. I spent the next two hours stumbling across said lava field, navigating mostly by the fading sunlight, dulled even more by the unfriendly clouds that had been gathering in the late afternoon. But I was 7.5 miles from mile 2000 by the time I camped, and just 9 from my next resupply. I was satisfied with my progress, all things considered. And I slept like a baby. I get shin splints just from reading your trail woes. Sorry to here it. 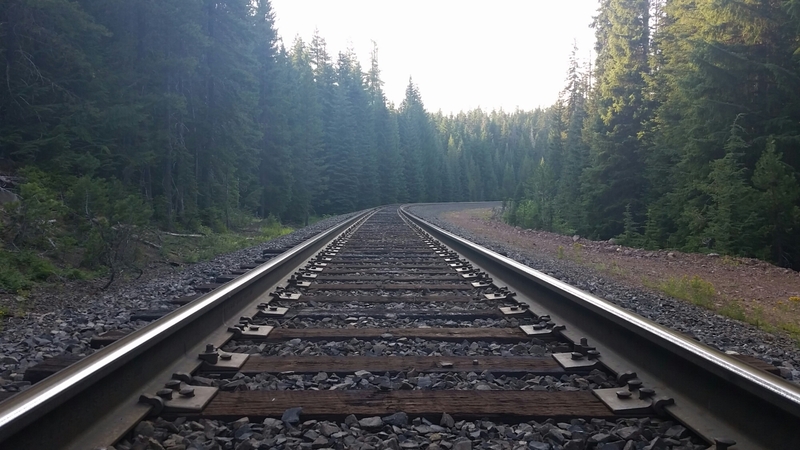 I saw your railroad pic. Do you not remember last season’s WD. STAY AWAY FROM THE RAIDLROAD TRACKS. we both know where they lead 🙂 hope your leg gets better. This blog is getting more and more painful to read.